The Tripp Lite P152-000 is ideal for changing the gender of a female DB9 port or cable to male. 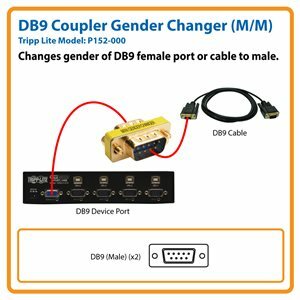 The gold one-piece adapter allows you to connect two female DB9 cables together or connect a female DB9 cable to a female DB9 port. The low-profile (less than one inch) unit is fully shielded against EMI/RFI interference. Gold-plated connectors with gold-plated contacts provide optimal resolution with no signal loss. The P152-000 comes with a lifetime warranty. It’s manufactured in compliance with strict RoHS specifications, reflecting Tripp Lite’s commitment to environmental responsibility.